A few months ago we posted news and information re Kanamodels Canadian Pacific Lineside Buildings on our web site. We were surpised at the level of interest from our customers re their products. I guess a number of our customers were not aware of Kanamodel's existance. Well, they make great laser cut kits of Canadian, prototypically correct structures. Kanamodels has just annnounced they will now release their Canadian Grain Elevator Complex for several of the most-seen wheat pools. Have a look at the image below. We are now taking orders. 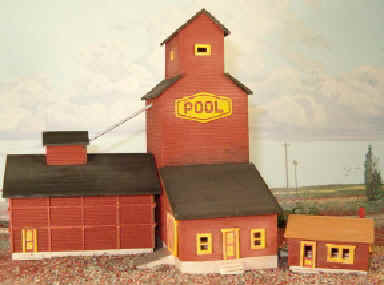 The complete set will feature a western style grain elevator, a grain bin (annex) and an office. Full color decals by Microscale will be included for either the Alberta Wheat Pool, Saskatchewan Wheat Pool, Manitoba Wheat Pool, UGG (Uunited Grain Growers) or Cargill.